back of flyers; map, specials, djs. 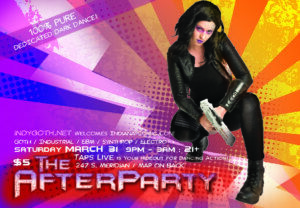 The Extended Adventures of IndyGoth Presents a Comic Con edition of our Goth/Industrial Afterparty on the Saturday Night of Indiana Comic con! Low-cover, 100% Dark Dance : action, thrills, drinking & dancing! A couple of blocks from the Indiana Convention Center, the basement of the 247 bars is THE HIDEOUT for the night, avoid the other clubs’ lines by entering in back! $5 cover, 21+ only. 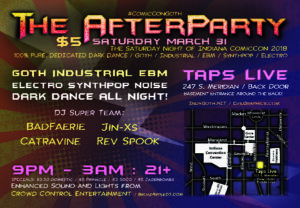 Cheap Drinks, and the DJ SuperTeam of Badfaerie, Jin-XS, Catravine, and Rev Spook!